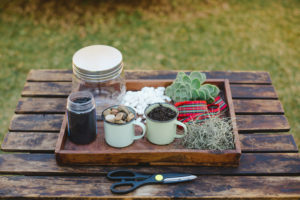 Affordable Plant Gift Idea – Succulent in a Jar. 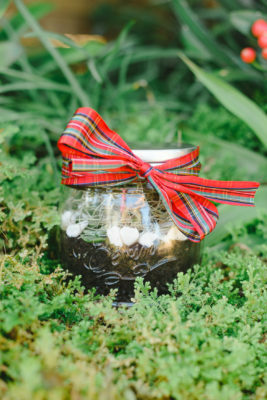 The perfect DIY present, a cute plant terrarium. It is fun and easy to do, and most people will love this gift. Even kids can make this great gift for parents, friends or teachers. Choose a clear, smooth glass container, it offers the best view of the plants inside. Open containers are ideal for plants that prefer less humidity, like cacti and succulents. Closed containers is best for moss and miniture fern, because they hold more humidity and create a jungle-like atmosphere. Place drainage stones in the bottom of the jar. Cover stones with a layer of charcoal (this filters the toxins when the jar is closed). Put soil on top of the charcoal, leaving enough space for the succulent. Plant your succulent, making sure you have the stem firmly grounded. Arrange white decorative stones around the succulent. Cover the stones with a portion of moss or Old Man’s Beard – laying it lightly on top of the stones. Cut a ribbon and tie it neatly around the jar lid. Place your terrarium in an area with lots of light, but not in direct sunlight. Check your terrarium for condensation droplets, if that happens, open the jar and let the excess moisture evaporate. Use a spray bottle to water your terrarium, and don’t over water – a collection of water at the bottom is too much. Watering once a week is good enough. Cacti and succulents go well together, emulating a desert landscape. Good drainage and air circulation needed. Low growing plant with moss-like appearance, small round green leaves on fleshy stems, moderate daylight. Most ferns are forest or woodland plants, needs moisture and humid conditions, keep in shady places, emulating rainforests. Easy to grow and care for, tropical, low growing and trailing plant, striking leaves of pink and green, white and green, or green and red. Moisture loving, slightly acidic soil (peat moss), carnivorous plant, ideal for open terrarium to ensure that it can capture insects.